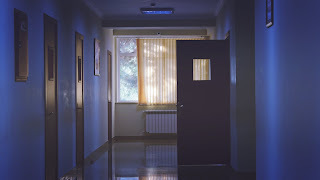 It was a long walk from my doctor's office to the place in the hospital where I had to lie still for an hour and be monitored for signs of impending labor after each appointment these days eleven years ago. Those days are filed way back in my mind, but when I was listing some of my favorite things about my husband in his Father's Day letter, I laughed to myself and remembered his Snickers bars. I never got much sleep the night before those appointments, both because I could not breathe from the excess fluid I was carrying in my womb and because I was crying out to God to carry us through whatever the next day would hold. By the time we had survived the drive down, the anticipation of the waiting room surrounded by baby bellies bulging with new life just below mama faces filled with fear, hearing the verdict one word at a time in the ultrasound room and dealing with whatever pain was necessary in the procedure of choice that day, I was shot. Some days, I'd swallow my pride and ride in the wheelchair. Other days, I would walk. Every time, my dear husband would make me wait just long enough for him to grab a Snickers bar and a Dr. Pepper on the way. I would grow so irritated with him. This was serious business - literal life and death. I had to fast until I got to the car, never knowing if I'd be delivering this baby in moments or not. How dare he! He gave me lots of excuses for why it was so necessary for him to have his snack while we waited and watched monitors. There is not a selfish or callous bone in the man's body, so this was completely out of character for him and always made my head spin and my mouth start running. I'd spend most of the hour guilting him for torturing me and he'd spend part of the time resting his head on my bedside and the other being so goofy I couldn't help but laugh at him. Before I knew it, the time was up and we were on the road. He never failed to swing by the place with the lighted donut sign and safely return his girls home. It was all part of his ploy. For nearly twenty years, that man has stopped at nothing to keep me laughing - and I do mean nothing. I have laughed through my tears in delivery rooms, recovery rooms, and the backseat of the limousine that carried us to the cemetery. No one is more uptight than I can be, so I really cannot express what a feat this is. In seasons when joy has been so incredibly hard to find, the man has squeezed out every last drop. God sent him to me when I was all of fifteen years old, so it's not like I made some wise choice in marrying him. Nothing about my life has been a result of my own wisdom, but every bit of it has been by grace alone. Something about that Snickers story pulled on my heartstrings and I found myself back reading the daily accounts I journaled on these days in 2007 on Miller Grace's CaringBridge page. I don't live there anymore. That's not what my life looks like today. That's not what my heart feels like either, praise God. Reading those words, I feel like an outsider looking in. I remember it all by heart, but seeing the unwavering faith and hope in God in those days when all I remember feeling was struggle? It screams of the Holy Spirit carrying us through the impossible. There's no other explanation. I know me and I'm not capable of trudging through that story, much less keeping my eyes on Jesus through it. It's not in me to do that, but - hallelujah - it is in Him and He is in me. He was. He will forever be. "The thief comes only to steal and kill and destroy. I came that they may have life and have it abundantly. I am the good shepherd. The good shepherd lays down his life for his sheep. I know my own and my own know me, just as the Father knows me and I know the Father; and I lay down my life for the sheep." I've said it before and I will say it until the day I die: satan is a punk. As long as we draw breath and try to use it to praise God, he is going to attack. Looking back on the days when he gained the most ground in my life, nothing brings me greater joy than to see even then, the Lord was crushing his head. We have no control over our circumstances, but we have absolute control over which direction we turn our faces and where we place our hope. When we look to Christ, we find life, even and especially in the face of death. "Yes, and I will rejoice, for I know that through your prayers and the help of the Spirit of Jesus Christ this will turn out for my deliverance, as it is my eager expectation and hope that I will not be at all ashamed, but that with full courage now as always Christ will be honored in my body, whether by life or by death. For to me to live is Christ, and to die is gain." The last week of June may forever make me feel a bit like I am walking on holy ground, but make no mistake. Neither my grief nor my daughter nor her death define me. The power of God displayed in the deepest valleys and tallest mountains alike, the way He's proven Himself faithful and so much more than able all the months of all the years of my life, the downright miracle it is that such an imperfect woman as this one has discovered the peace (whether or not she is always humble enough to accept it) that makes it possible to rejoice and walk in peace with full courage that Christ will be honored in my life, whether by life or by death, simply because He's called me His own - that's what makes me who I am, a child of the Most High God. Brothers and sisters, may we never forget who we are or whose we are, even and especially when we are crying out to God to carry us through whatever tomorrow may hold. Find the courage to cry out when you need to cry out, then stand up and walk. He's already there and it's all going to be alright. Promise. If you get real lucky, somebody might even eat a Snickers bar right in front of you and make you laugh right there in the middle of your crisis.